Tombstone Territorial Park is a territorial park in Yukon, Canada. It is located in central Yukon, near the southern end of the Dempster Highway, in an area of rolling tundra. The park is named for Tombstone Mountain's resemblance to a grave marker. Mt. Tombstone was first climbed by Martyn Williams, Jurg Hofer and Liz Hofer on June 21st 1973. It was made a park in 2000. ^ "The Yukon wilderness travellers guide". worldcat.org. Retrieved 6 August 2015. ^ Earle, Teresa (9 August 2003). "Northern exposure". The Globe and Mail. Retrieved 25 February 2011. 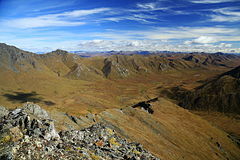 Wikimedia Commons has media related to Tombstone Territorial Park. This page was last modified on 9 February 2016, at 18:55.